I know I've mentioned that I love grilling, especially in the summer. 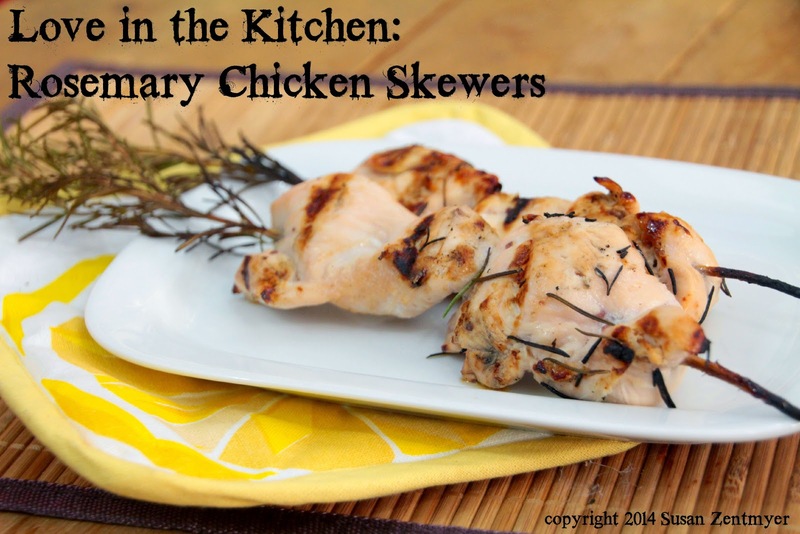 Chicken on the grill is wonderful for busy weeknights because it cooks so quickly. I also love rosemary. I planted a small plant in our yard years ago, and we have a massive bush now. I use it in all kinds of things, from savory dishes and breads to jelly and even cookies! 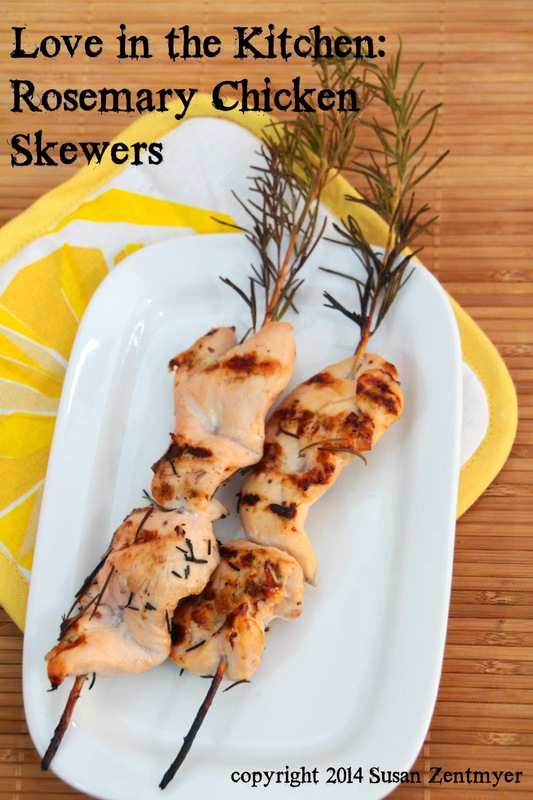 Using fresh rosemary sprigs as skewers serves two purposes: it infuses the meat with just the right amount of rosemary flavor (too much can get overwhelming, especially with the delicate flavor of chicken breast) and provides a skewer that doesn't burn immediately - no soaking required!. This recipe goes together in a snap, and tastes great with a fresh salad and some crusty French bread. Mix together the oil, garlic powder, oregano, basil, pepper, salt, and onion powder. Pour in the vinegar and lemon juice, and mix vigorously until well blended. Marinate the chicken pieces in the vinaigrette for at least 15 minutes and up to 3 hours. Leaving a bushy "top," strip the rest of the needle-shaped leaves from each rosemary sprig to make a "skewer." 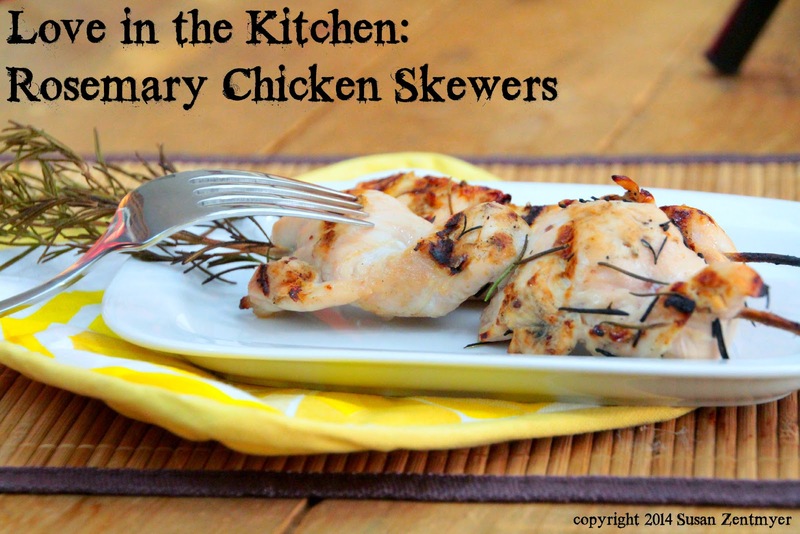 Thread the chicken cubes on the skewers, placing a roasted garlic clove between each two cubes. Season the skewers with pepper to taste. Preheat the grill until very hot (if using a charcoal grill, places charcoal briquettes on one side only). Add the chicken skewers and lower heat to medium (for charcoal grill, place the skewers on the side without the briquettes). Grill for 4 minutes on each side, until the chicken is firm. Sprinkle with additional salt and pepper. Serve immediately.